It goes without saying that, short of adventure travel for those who like rappelling down a waterfall, the Caribbean has been so homogenized as a tourist destination that it's easy to wake up in any bed and have to remind yourself whether you're in Aruba, Antigua, Jamaica or the Bahamas. Not that you can't find deluxe chain resorts dotting the region, or family destinations built on the Disney model, but to get a true sense of an individual island as a unique place that has not undergone either gentrification or overdevelopment is increasingly rare. So a recent trip to Nevis, in the Leeward Island chain, showed me that very little of the island's charms have changed in the twenty-five years since I last set foot there. Back then the big news was the opening of a posh Four Seasons Resort, which I took as the opening shot for rampant development of an island whose natural beauty had lain untouched beyond a few small inns and guesthouses built into the woodlands and rocks of a landscape that looks across the channel to St. Kitts. 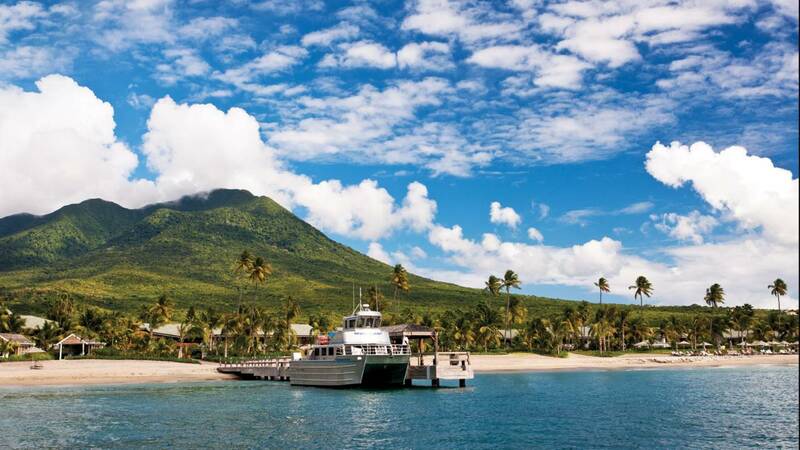 In contrast to the dry and overdeveloped territory of the latter, Nevis is lush with forests and tropical growth, an oval-shaped island where goats, sheep and monkeys run wild, and a place of quiet relaxation. Little interrupts the pace of life on Nevis, and for that it is at once a step back in time and an admonishment that something so fragile can be lost at the first sound of an earthmover. The capital city of Charlestown, itself a riot of Crayon colors, seems always bustling, with a food market open to the trade winds, boutiques, eateries, and a tourist office that you will find very helpful. Along the perimeter are beaches of white coral sand flecked with volcanic brown and black, while the basin-like interior forms a plain watered by natural springs. No wonder the first natives here, the Caribs, called it the "Land of Beautiful Waters," and to this day the island's anthem is titled "Oh Land of Beauty." Columbus sighted the island in 1493, and it became a key port for East-West trade among many countries. The name Nevis is derived from Spanish for Our Lady of the Snows, which seems odd for a tropical island; it was Anglicized to Nevis when the British took possession. 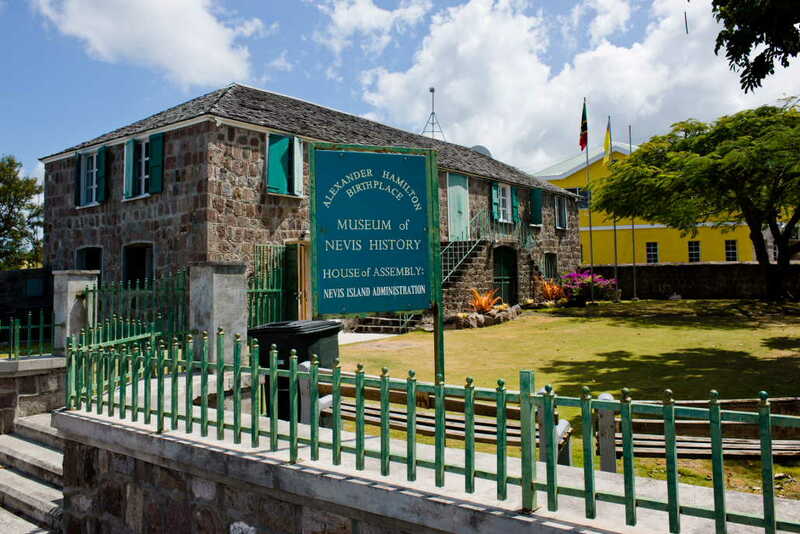 In fact, Alexander Hamilton was born on Nevis and has his own museum, while Lord Horatio Nelson was stationed here and married a local girl named Frances Nisbet, and that, too, has been memorialized. Captain John Smith stopped here on his way to the founding of Jamestown in 1607, and the poet Samuel Taylor Coleridge visited. 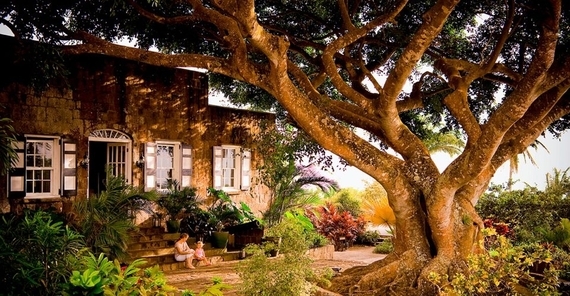 The remains of British colonial days can be seen in the 18th century Hermitage Plantation, the oldest surviving wooden house still in use in the Caribbean, and the Caribbean's first hotel, Bath Hotel, built in 1778. As Nevis developed into prime territory for sugar plantings, slavery came quickly to the island and the native people died out, so that by 1780 ninety percent of the islanders were black. Its subsequent history is as full of grand and notorious events and schemes as any in the Caribbean, figuring in various European wars, until in 1882 it united with St. Kitts and Anguilla. Those islands became independent in 1983, though still showing fidelity to the British crown. It took a while for civilization to make incursions into the island's life: electricity was introduced in 1954, telephones in 1967. International banks followed. 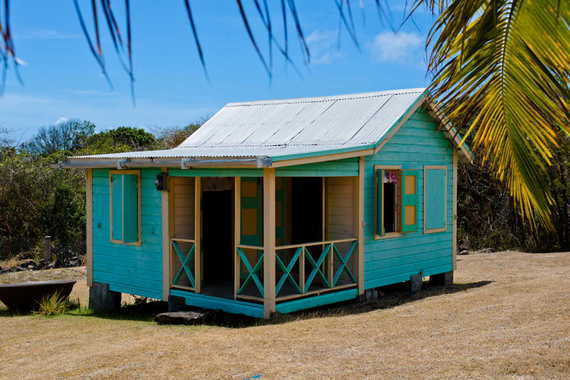 Today, although wi-fi can be tricky, the modernization of the island is as complete as any of its neighbors, and Nevis has found its footing as a tourist destination, not least because it is so remote and largely unspoiled. As so often happens, a natural disaster can force improvements long needed on an island like Nevis, and 1999's Hurricane Lenny shut everything down, including The Four Seasons, for two years. This had the effect of spurring new construction while maintaining the island's unique biodiversity. The Four Seasons remains the island's largest hotel, and there are far more guest houses and inns than hotels. My wife and I stayed at the enchanting Montpelier Plantation (above), which has its own private beach (reached by shuttle), where we enjoyed a mid-week barbecue lunch accompanied by plenty of planter's punch. The 1687 inn has been owned and run by John and Helen "Muffin" Hoffman since 2002, and it has 19 air-conditioned rooms, a fine restaurant (I shall write about in my next installment), and an old sugar mill now used for party dining. There is an open spa and bicycles are provided for exploring the island. Highly colored modern art, including textile wall hangings, are everywhere, and the setting itself amidst swaying palms is conducive to staying put for days. Which is not a bad idea since the inn is six miles from Charlestown. Right down the road is Lord Nelson's house and beyond that an exceptionally beautiful botanical garden of tropical flowers and plants, along with 100 species of palms and a Rainforest Conservatory. I also managed to visit, though not stay at, the very new Paradise Beach Resort (above) near Charlestown, the only boutique hotel located right on the beach. 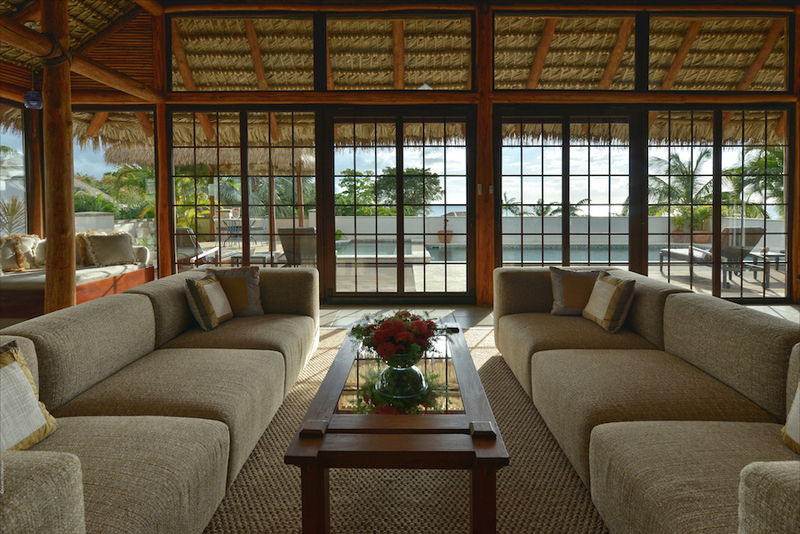 The individually designed thatch-roofed villas have three and four bedrooms, a huge Indonesian-style living room with vaulted ceilings and state-of-the art house kitchen. Spacious bathrooms are tiled with marble--some with outdoor shower--and guests in need of anything have only to call one of the certified butlers or a private chef. 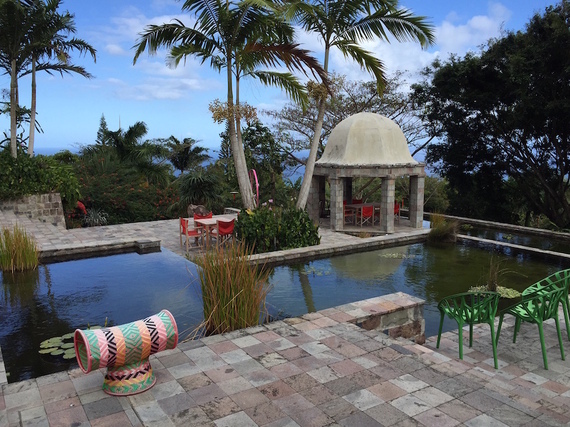 A more unusual place to stay on Nevis is the 11-room Golden Rock Inn (above), built over 100 acres by artists Helen and Bruce Marden, who use it as much to entertain friends as guests. The appropriately named architect Raymond Jungles has created masses of tropical vegetation, winding pathways, and pools of water, all dotted with scarlet-colored gates, benches, shutters and fabrics. One caveat: Golden Rock has no air-conditioning, and Nevis has a humid, tropical climate year round. And you should like monkeys, for they are very much at home here among the palm trees and mangoes.